I love blueberry muffins. I usually just buy a box of blueberry muffin mix. I really like the little wild blueberries that come in the box. 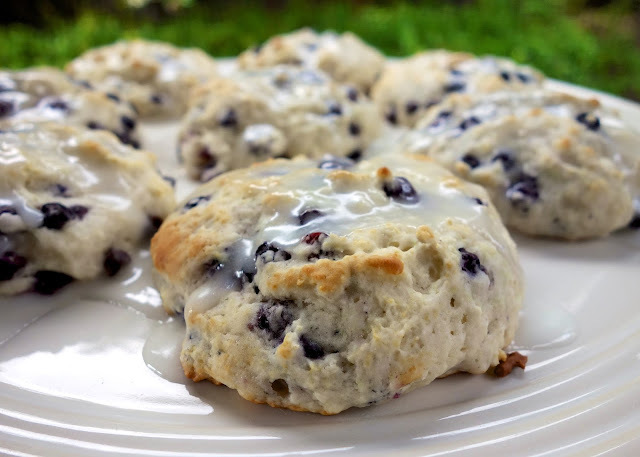 I recently bought a bag of frozen wild blueberries and decided to make some quick blueberry biscuits. These biscuits were great! They were so easy to make and tasted fantastic! They could easily be made before work or school. 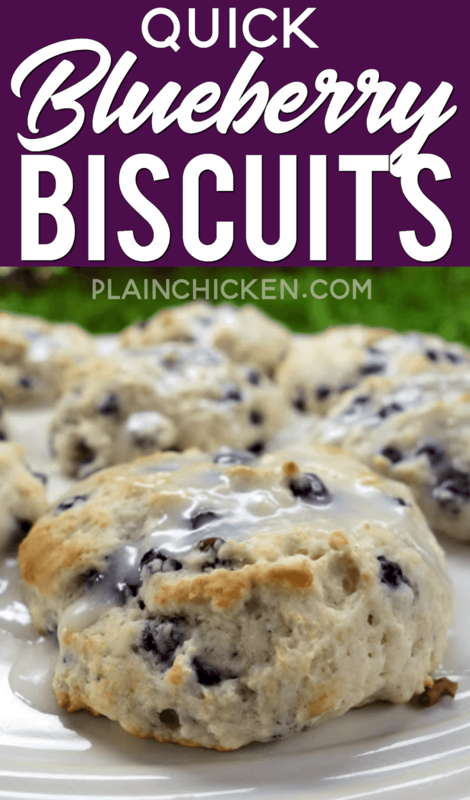 These biscuits are just as easy as making a box of blueberry muffins, but taste much better. Next time I add a little lemon zest in the batter. 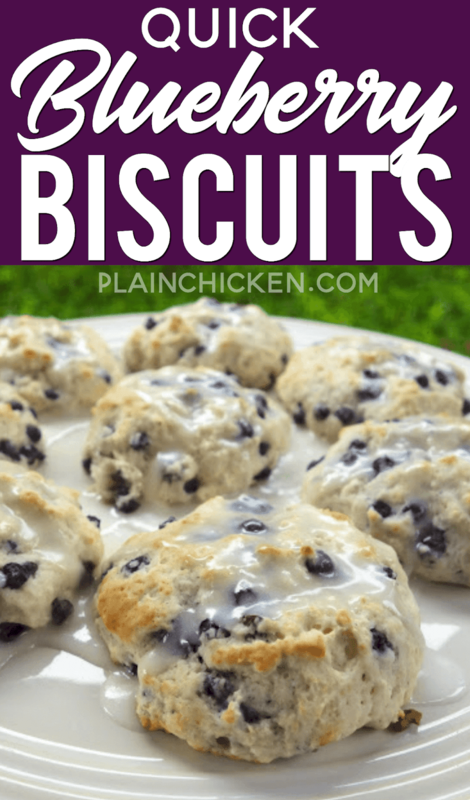 Give these a try the next time you need a quick and tasty breakfast! Stir together bisquick, sugar and buttermilk until soft dough forms. Fold in blueberries. Scoop dough with large cookie scoop or ice cream scoop onto ungreased cookie sheet. Bake 9-12 minutes or until golden brown. Combine powdered sugar and milk. Drizzle over biscuits. Bookmarking these to make soon! Loving this recipe. Reminds me of the "Hardees" biscuits I used to eat as a kid! I am always looking for something different and good to make with our bluberries. These look so good...can hardly wait to try them. Just got some blueberries today. Now I know what to use them for! These are seriously yum! I suggest frozen berries. They thaw plenty fast enough while baking and won't break up while being mixed. 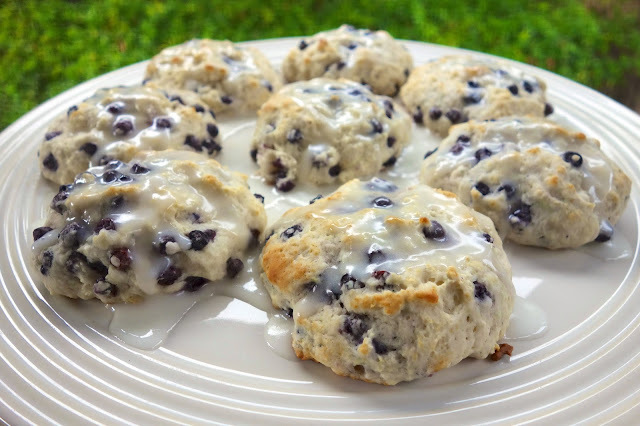 I have never thought of making blueberry biscuits, only muffins! What a great (and delicious) idea! Did you use 3/4 or 1 cup buttermilk? Not sure what soft dough means. Mine tasted terrific, however were a bit flat....sort of like puffy pancakes. Cruiser - the dough needs to be thicker than pancake batter. Start with 3/4 cup of butter milk. It will just depend on how much you pack the bisquick when you scoop it. The dough should be sticky and moldable. Can I replace blueberries with strawberries? has anyone used just plain milk in place of buttermilk? we do not like buttermilk so I never buy it because it goes to waste after using in a recipe. I know you can make buttermilk by adding vinegar to the milk and let it set. Maybe I'll try that when making this recipe.